Scotland is a land of lochs, castles and epic landscapes, all served up with the warm welcome and charm of the locals that call this magical land home. I feel like a traitor being an English boy, but if you are looking for a stunning road trip in the UK, then Scotland should be your first port of call. My road trip in Scotland took me from the countries festival city of Edinburgh to the rugged landscapes of the Isle of Skye, here are some of my favourite spots you shouldn’t miss during your one-week visit to Scotland. Take a video tour of all the places I visited on my Scotland road trip, including an extended section on the Isle of Skye. Scroll down for more details on each stop. 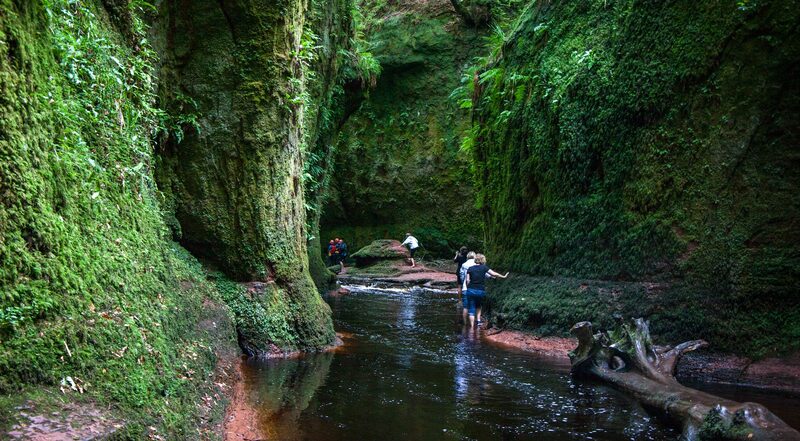 The Devils Pulpit as it’s nicknamed or Finnich Glen officially is just a short drive from Glasgow and still a relatively unvisited spot. It’s not the easiest place to find, but the blood-red waters, moss-covered caves and countryside walk to get there make it a good spot while heading away from the city. Be warned, the path down is slippy but for the more adventurous you can wet-suit up and walk in through the river. The quaint villages with small houses and colourful flowerbeds around the lake provide car parking opportunities and packing a picnic to have lake-side is a must. For hikers or cyclist the trails around the lake are relatively flat compared to the highlands, and with deer dancing around the woodlands, it’s a picturesque spot to take in without exerting too much energy. 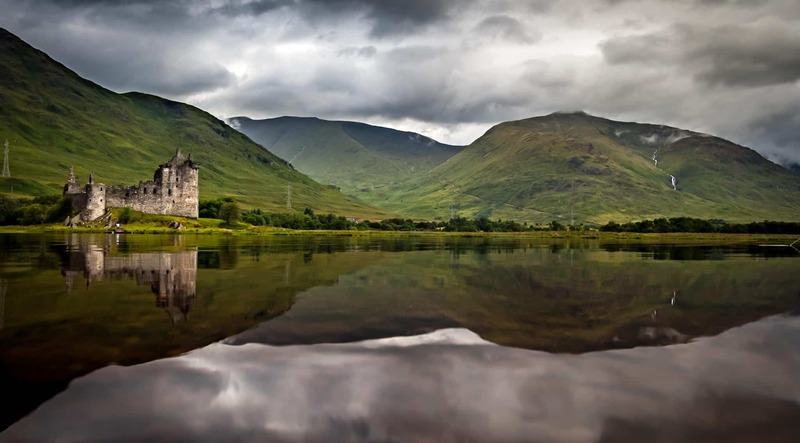 The ruins of Kilchurn Castle make for an epic reflection shot if you catch Loch Awe on a still day. It’s a short walk from the road to the edge of the lake but thanks to the mountains, ducks and castle one of my favourite places to photograph in the whole country. The loch has a few islands within it such as Inishail, and I’m determined to get back here with a SUP and enjoy a lazy day photographing. The small village of Glencoe is most famous for the Glencoe Valley, a must-visit during a Scotland road trip to the highlands. One of the most impressive filming locations of James Bond Skyfall it’s not surprisingly one of the most famous valleys in the country now. Find a place to park the car up and take a hike through the valley where waterfalls roll down the mountain, and the views will leave you in complete awe. 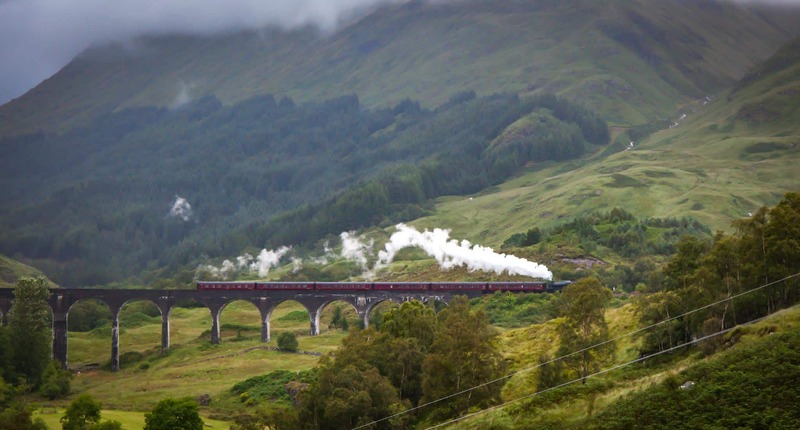 Another famous movie set, the Glenfinnan viaduct is the Harry Potter route to wizarding school, and you may even want to pause your Scotland road trip to jump on the famous Jacobite train that runs along here. Just next to the viaduct at Loch Shiel is the Glenfinnan monument which honours those from the Jacobite rising. 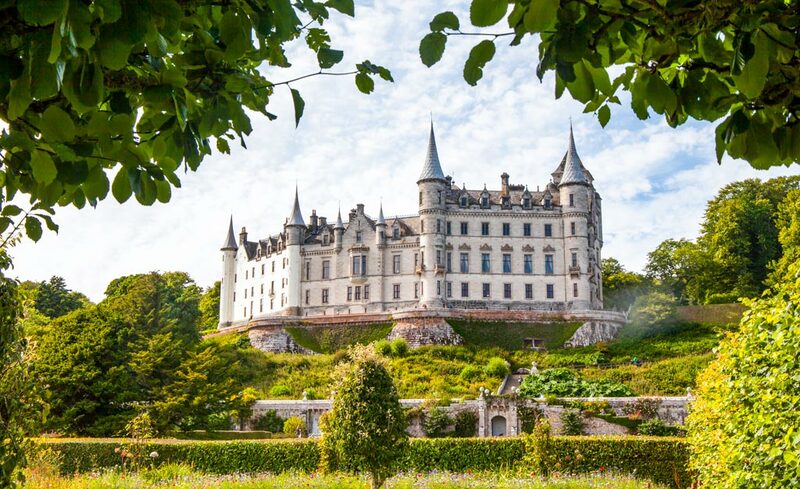 One of the most beautiful castles to visit on a Scotland road trip is Dunrobin castle on the east coast. This stately home is open to the public, and from the grounds, at the back, you get a far more impressive view of the white castle with it’s pointed roofs. It’s a little bit of a detour unless you plan to go norther on your Scotland road trip but one that is entirely worthwhile. Nearby Mallaig is the starting point for ferries and the terminus for one very famous train journey. On the west coast of the Highlands, you can get in some great R&R and enjoy the slow village pace here before continuing on your Scottish road trip. 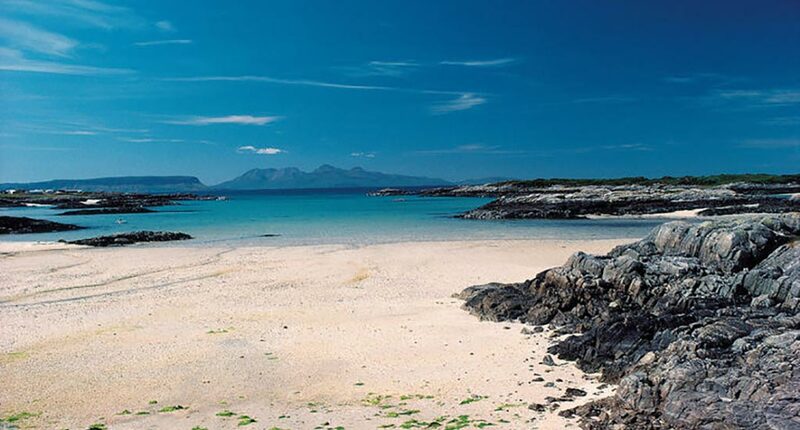 Arisaig is a great spot to hire a Kayak and get that fresh Scottish air into your lungs on the water. 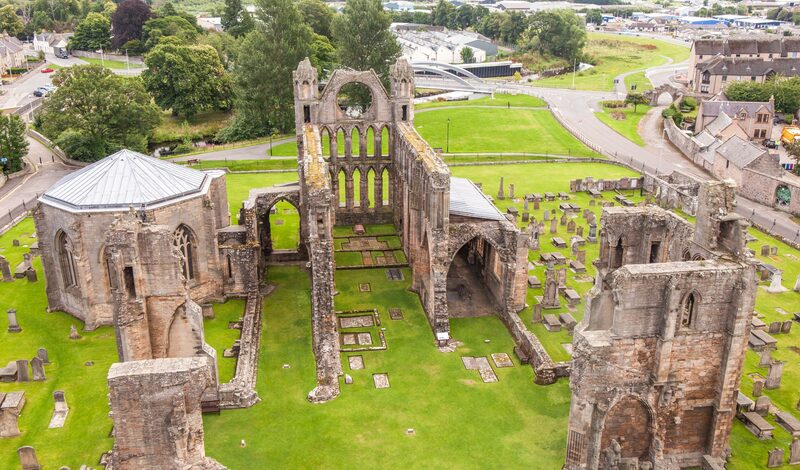 The ruins of Elgin Cathedral in north-east Scotland are a comfortable detour from Inverness and given the age of the cathedral (1224) what does remain is in reasonably good condition. You can climb up the towers for an aerial view to really appreciate the scale of the cathedral. The city of Inverness surprised me and was a great half-day stop on my Scotland road trip. Grab some food here and visit the Cathedral and Castle before continuing to one of Scotlands most famous sights, Loch Ness. Famed for the Loch Ness Monster, there is even a museum/theme park dedicated to her which would be an ideal road trip pit-stop with kids. Beyond the myths, though this is a beautiful part of the country to set up camp and enjoy the walks along the lake. 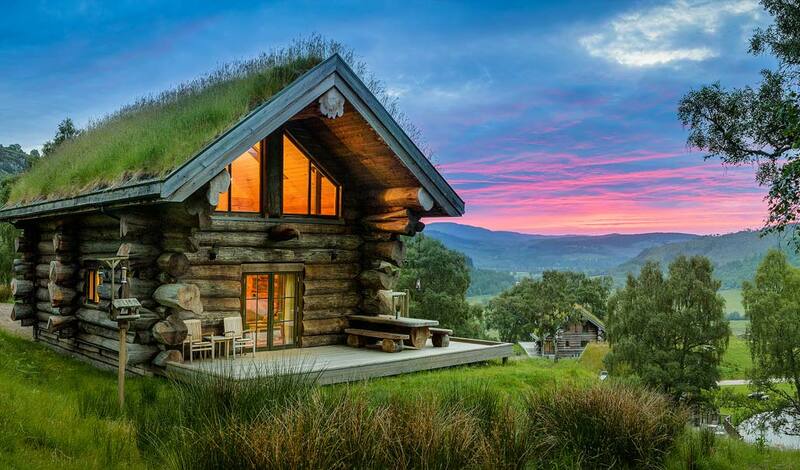 Just a forty-five-minute drive from Inverness you’ll find the stunning and remote Eagle Brae log cabins. 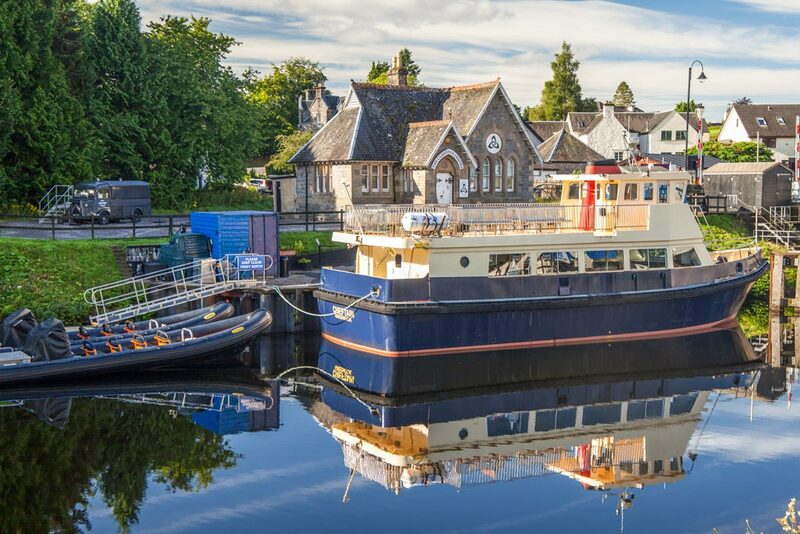 Situated in the Scottish Highlands, this is a fantastic escape and the ideal spot to base yourself for a couple of days of getting away and connecting with nature. The Cabins are packed with mod-cons and everything you need, although still have a charmingly old-school vibe and a fantastic view to catch the sunset at. With deer strolling around, hikes on your doorstep and the chance to be at one with Scotlands most exceptional nature, this is one of the most unique and exclusive accommodation options you could stay in. Cabins come in different sizes and on the website, eaglebrae.co.uk, you can find more details. It’s a given on any visit to Scotland you shouldn’t miss the capital city of Edinburgh. If you are lucky enough to visit during August, then Edinburgh Festivals will be in full spring, but the Edinburgh events calendar is year round with 12 festivals in Edinburgh throughout the year. It’s by far one of my favourite cities in the world, and you should check out my article on things to do in Edinburgh to get the most out of your visit to the city. Scotlands second city of Glasgow is somewhere I have a soft spot for. I spent a few months working here when I was in the restaurant Industry and got to know the city pretty well. While it might be a bit more ‘rough around the edges’ than Edinburgh and the accent takes a while to get used to it’s a buzzing city and has a booming food, music and art scene with some excellent museums. The Isle of Skye has become one of the most famous and most popular islands to visit in Scotland and as such is starting to suffer from over-tourism, especially during the summer months. As such, book in advance, be mindful of the local residents and if you can visit in the offseason. That said, as soon as you lay eyes on it, you will see why everyone wants to visit here on their Scotland road trip. From the beautiful fairy pools of trickling waterfalls to the colourful houses in the capital of Portree, you can easily spend a few days here in total awe of the natural beauty and varied landscapes. Get out the car and get out hiking here because some of the most beautiful places such as the Storr rock and mythical Fairy Glen can’t be enjoyed through a car window. Don’t forget there are 790 islands in Scotland so if you have more than a week for your Scotland road trip, or fancy going more off the beaten path, then you really are spoilt for choice. Your pictures are beautiful and your writing is amazing. You have inspired us to document our lives and live by a motto. Always try something once. Thanks for sharing! 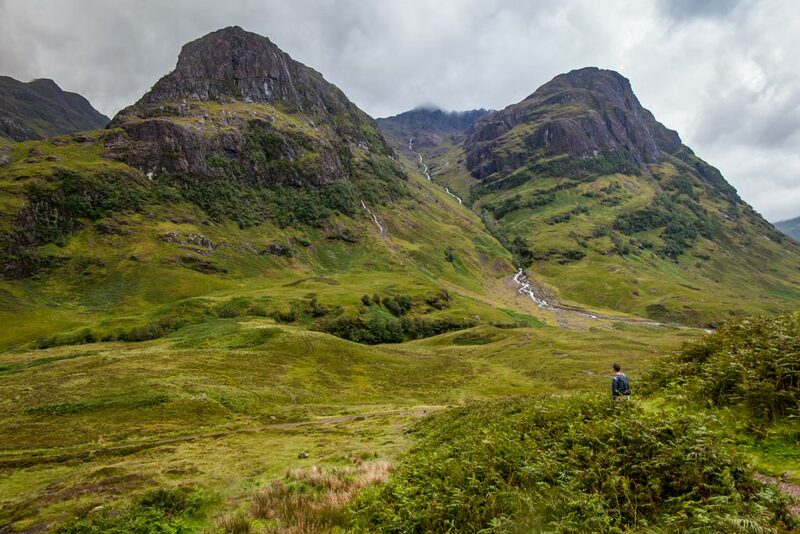 I’ve always wanted to go to Scotland, and this article makes me want to go there even more. Scotland has always seemed so fantastical to me with all the medieval castles scattered about the beautiful but mysterious landscape, and your photography and descriptive imagery really amplifies this feeling. Nice post. I haven’t been to Scotland yet but I could tell it is an incredibly beautiful country. Glencoe and Loch Awe both look amazing. A wonderful blog post with lots of beautiful pictures of Scotland. Scotland is a beautiful country, full of history, with wildlife but very beautiful. I hope to visit Scotland in the future. 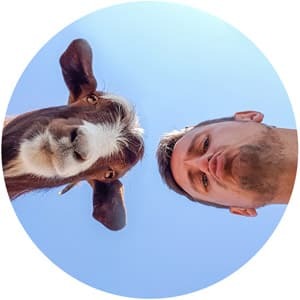 This presentation is really awesome! I wish to visit Scotland by road. Great post, road trips are always awesome. I have lived in Edinburgh for three years, and I am shocked to say that most of these sights are new to me! How could that be? I always return to my favourite city in the world, so I’m sure to be checking out some of these sights around Scotland in the future! These photographs are so beautiful. 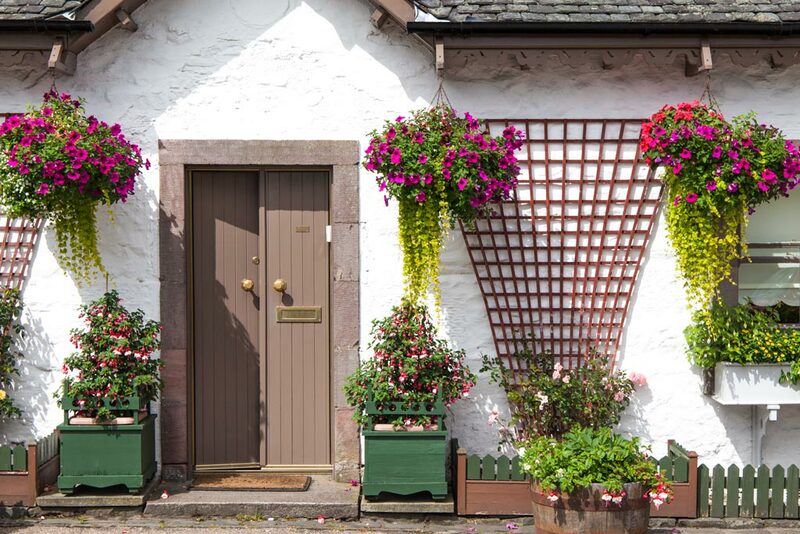 The village of Glencoe seems to be so tranquil and peaceful – we definitely want to go! We’ve also just published our new blog dedicated to seeing the world through analog photography and exploring stories that share experiences from the mundane things to the exciting, especially when travelling. Would be awesome if you could check it out and let us know what you think!